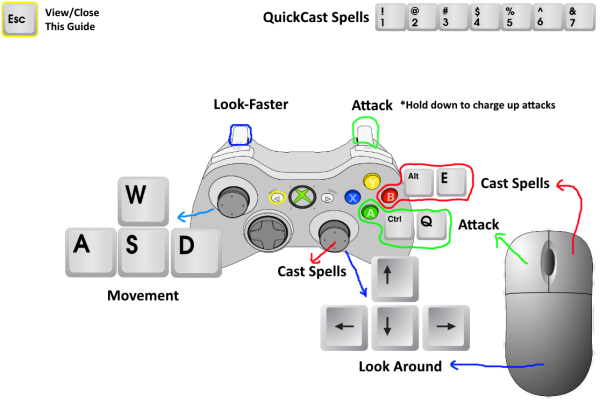 Local Co-Op, in the context of Virtual Reality, means a non-VR player can interact with the VR player using the PC via keyboard/mouse or gamepad. This is a great way to get more people involved rather than just spectating, as it's impractical to have more than one VR room in the same home. In other words this is the VR equivalent of a LAN Party. In Defense of Castle Chilly, One additional player can join the game as a small Fairy. This Fairy is a Support Hero, whose spells are designed to compliment the VR Archer. The Fairy can still only move around within the immediate room-space of the VR player. If the player moves through a portal doorway - the Fairy will teleport as well. Unlike the VR Archer, the Fairys mana regenerates slowly over time. Any time a game of Endless,Last Stand, or Campaign starts, you can press 'A' or 'Ctrl' or 'Click' to jump in as the Fairy. For the purpose of Highscores, be aware that by helping the player their final score will be halved. Couple your energy with the magicks of Castle Chilly to receive one of several blessings. The Castle will attempt to give you what you need the most. Each blessing is randomised but their chances are increased proportionally to how desperately you need each one, but some blessings will only be given out once. Halve the amount of damage The Captain has sustained. The remaining damage will also heal 25% faster than usual. Create an energy shield around The Captain for 10 seconds. This barrier will block incoming arrows. If an opponent attempts to melee through the barrier its remaining energy will apply as damage to that opponent. Enchant an arrow in the players hand. When this arrow is launched you will gain complete control over it. Guide its direction using the same controls you look around with. Speed it up or slow it down by using your movement forward/back controls. It also deals more damage than a normal arrow. Why should The Captain have all the fun? This spell summons a fireball in your hand. Your next basic attack will be an explosive shot (just as potent as an explosive arrow). This spell summons an enhanced bolt in your hand. It acts similar to the Arrow Volley enchantment. Your next basic attack will summon many more bolts mid-air. Make sure you shoot this at far away targets to get the most out of it. As the Fairy, your primary objective is to assist The Captain. You can attack enemies, but your mana goes much further when used to help The Captain (The VR Archer). Fireballs and Volleys are more expensive for the Fairy than for The Captain. When the lane is filled with enemy archers, your mana is best spent on creating shields to block the incoming arrows. If The Captain is engaged in melee combat, heal them as fast as you can because the next hit they take may be their last.